Stylish Star Allu Arjun teamed up with mass action entertainers’ specialist Boyapati Sreenu for a high voltage entertainer titled Sarrainodu. The first look poster, which was released on the eve of Republic Day, got a thumping response and lived up to the fans’ expectations on the Bunny-Boyapati combo. Even though the first look poster revealed that the film will release in April, there was no clarity over the exact release date. 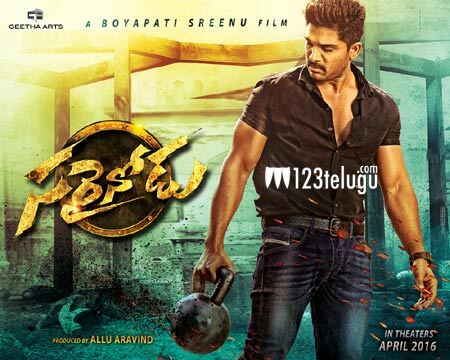 However, producer Allu Arvind announced during the first look launch that Sarrainodu will hit the screens on the 8th of April on the occasion of Bunny’s birthday. Rakul Preet will be seen romancing Bunny and Adhi Pinisetty will be seen in a negative role. Senior actor Srikanth will be playing a crucial role in the film.